With a subtropical dry climate and temperatures ranging from down to 10 degrees in winter and up to 48 degrees in summer. It rains only about five days a year, with an average fall 13 cm rain drops. With a subtropical dry climate and the temperature can range from 10 degrees in the winter and up to 48 degrees Celsius in the summer. It rains only 5 days a year, with an average fall of 14 cm rain drops. Generally the weather in Dubai is humid and hot with daily sun, there can be rain between December and March, this is the best time to travel to Dubai where the weather is at its most comfortable. But lately 2010 and 2011, there has been a change in weather not just in Dubai but all over the world, as for the moment Dubai has unexpectedly received rain for more than they were prepared of. There has been over floods some of the small Cities in Dubai, as well sand storms in the desert. As we all have noticed there has been changes in weather many places Dubai is not an exception. 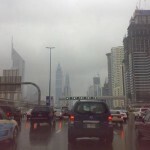 For more comfortable travel and adventure in Dubai you can read the expected weather reports in the news or internet.